XPRIMM: How do you comment on the 2016 market results? Klime POPOSKI: The insurance industry had a relatively successful year despite the impact of the risks of non-economic nature, registering increase in the GWP, growth of the assets and increased investments, higher employment, as well as increased number of the insurance intermediaries. The gross written premium (GWP) showed an increase of 5.34% with a concurrent increase of 7.74% in the number of insurance contracts. The non-life insurance companies reported profits of 451 million, a decrease of 4.02% over the previous year. Non-life insurance GWP, producing 85.19 of the total GWP, reached 7.43 billion, an 3.5% increase over the previous year (2015: 7.18 billion). In the structure of GWP, the most important category is the compulsory MTPL with a share of 44.22%. GWP for this line of business reached 3.86 billion, an 4.48% increase over 2015 (2015: 3.69 billion). Second category belongs to the property insurance with 17.83% share. This line of business GWP reached 1.55 billion, a decrease by 5.26% (2015: 1.64 billion), with a simultaneous increase of 11.65% of insurance contracts, which indicates higher price competition between insurance companies over the previous year. The insurance contracts in the retail segment rose by 13.77% accompanied by an increase of 12.02% of GWP, while the insurance contracts in the legal segment rose with 6.42% of the contracts, followed by a decline of 8 71% of GWP. Third-largest non-life insurance is the motor hull, which accounts for 8.70% of the total GWP, reaching 758.47 million GWP, an 9.46% increase over 2015 (2015: 692.29 million). Accident insurance increased by 11.08% with 665.18 million GWP (2015: 598.85 million), while the share of this class of insurance in the total GWP amounted 7.63%. In the last year, we were witnessing a progress regarding the health insurance. Health insurance is a relatively new insurance product, with modest beginnings in 2013. In 2016, 1.300 contracts were concluded with a total GWP of 45.22 million, compared to 2015 when there were only 368 with a total GWP of 6.37 million. XPRIMM: Did the life insurance sector confirm the significant upswing trend seen in the first part of the year? 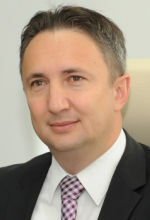 Klime POPOSKI: The life insurance GWP, producing 14.81% of the total GWP, reached 1.29 billion, an 17.32% increase over the previous year (2015: 1.10 billion). The largest share in the life insurance belongs to the endowment life insurance (73.82% covering both maturity and death, 8.27% only maturity, 5.56% only death), additional life insurance with 7.89% and unit-linked life insurance with 4.45%. 2016 brought a boom in unit-linked insurance. This type of life insurance appeared for the first time on the domestic market in 2015 when there were 325 contracts concluded with a total GWP of 7.71 million, but as of 2016 the insurance contracts reached 1,466 with a GWP of 57.46 million. The life insurance companies reported profits of 54.2 million, an increase of 19.51% over the previous year. We expect the endowment life insurance to keep the positive, but slower trend, and continuation in the high trend in the unit-linked insurance. XPRIMM: Please comment on the MTPL market evolution. Did 2016 bring significant changes? Klime POPOSKI: The average MTPL premium in 2016 accounted 5,331 with no significant differences compared to previous years. On the other hand, the average paid claims have a decreasing trend from to 61,652 in 2016, compared to 2014 when it amounted 65,756. The MTPL combined ratio improved in comparison to the observed trend. XPRIMM: During 2016, did any legislative changes occur in the Macedonian market? Klime POPOSKI: The Insurance Supervision Law has been amended in order to comply with the changes in the General Administration Law. There are 10 by-lays enacted, mostly amendments to the previous in order to eliminate the paper based submission of the supervisory reports to ISA, as well as introduction of additional statistical reports. XPRIMM: What do you expect for 2017? Are there any regulatory changes to be expected? Klime POPOSKI: During 2017, we are expecting growth in the GWP for both non-life insurance and life insurance. The increase is expected in higher sales of voluntary non-life insurance, as well as in the life insurance, especially in the unit-link insurance. There are no major regulatory changes expected in the 2017. At the moment, there is an ongoing EU twinning project with the final goal to produce regulation harmonized with the Solvency 2 directive.